[Sponsored content] THE COST OF LEARNING—WILL LOCAL EDUCATORS HAVE TO STRIKE? Increasingly, we see teachers across the country, taking a stand and walking out of their classrooms in hopes of increasing their pay. Those outside of the education profession may read the headlines and grumble to themselves about teachers having summers off. If you have a teacher or other school employee in your life, you know the amount of time and dedication they put into their jobs. Last year, teachers in Louisiana were paid 10.8% less than what they were paid in 2008, after adjusting for inflation. Only three other states saw a worse decline in teacher pay. These educators tell stories about coming out of pocket to provide needed supplies for their students due to limits on funding for their classrooms. Most Louisiana school employees, including teacher aides, custodians, bus drivers, cafeteria workers, and others make below $23,000 a year—often having to supplement their income with food stamps and second jobs to provide for their own families. “Educators across the state are standing together to raise public awareness about the need to prioritize school funding. 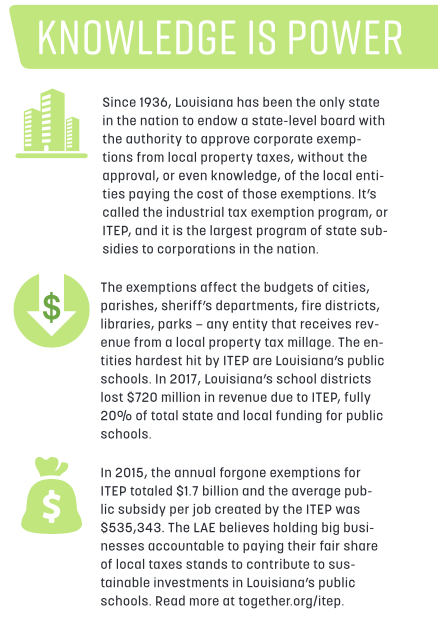 This important issue impacts more than just teachers and other school employees in Louisiana, it affects our communities, our children, and the future of this state. Louisiana voters must recognize the role state lawmakers play in this important issue. As the legislature heads in to annual session, citizens must make a commitment to hold state senators and representatives accountable to focusing on ensuring long-term investments in Louisiana’s public schools—investments that will not only increase pay for educators, but also enhance the educational experiences of students across the state. Geaux Red for Ed Louisiana aims to raise awareness and public support around investing in our schools. Visit redforedla.org to learn more.